When Ygor brings the Monster to Dr. Ludwig Frankenstein for care, Ludwig gets the idea of replacing the Monster's current criminal brain with a normal one. After the highs of 1939’s The Son of Frankenstein, we come back to earth with the much more pedestrian sequel, 1942’s The Ghost of Frankenstein. This story picks up where its predecessor left off, but it fails to reignite the same sparks and excitement. In Ghost we meet another son named Dr, Ludwig Von Frankenstein (Sir Cedric Hardwicke). He struggles to avoid the nasty shadow of his relatives, but fate will not allow this, as Ygor (Bela Lugosi) brings the monster (Lon Chaney, Jr.) to his attention. The creature needs a new lease on life, and Ygor blackmails the good doctor to get him to perform the work. A happy medium seems to be found when Luddy plans to plop the brain of a recently-deceased genius doctor into the monster’s body, but Ygor - assisted by jealous Dr. Bohmer (Lionel Atwill) - concocts a plan whereby his own mind will land inside the creature’s powerful form. All of this boasts some potential, but the result seems flat and bland, especially compared to the joys of Son. Perhaps if I hadn’t watched them back-to-back, I might have enjoyed Ghost more, but it really suffers via direct comparison. I won’t call Ghost a bad movie, as lord knows I’ve seen plenty of true clunkers via some of the other Universal monster flicks. Nonetheless, Ghost feels like a bit of a retread as it tries to redo Son but fails to achieve the same highs. For one, Ludwig seems less compelling than Son’s Wolf. Part of the problem resides with the actors, as Hardwicke never gets into the spirit of things in the manner shown by Basil Rathbone in the prior film. However, a lot of the issues stem from the blandness of Ludwig character himself. Compared to the haunted genius of Wolf, Ludwig feels like nothing more than a drab goody-goody. He brings a hole at the center of the flick. Lugosi also fares less well here. In contrast with the vicious nastiness he showed in Son, he feels almost kindly here, despite his evil plans. Ygor looks much less grotesque, so I guess someone gave him a makeover during the interim. Ygor lacks the serious menace and insanity seen earlier, and this harms the film. As for the monsters themselves, Chaney can’t compare with Boris Karloff in Son. Young Lon tried to become the greatest movie monster actor of all, but he failed miserably. Chaney’s turns as Wolf Man Larry Talbot seemed decent, but all others flopped badly. In addition to this spin as Frankenstein’s monster, Chaney played the Mummy and Dracula, and he seemed ill equipped for all of them. Karloff was easily the best actor of the monster regulars, and his absence clearly hurts Ghost. How about that title, by the way? Though most of these horror flicks from the era never bothered to justify themselves - continuity errors abounded - Ghost did at least attempt to make its title work. We briefly see Ludwig’s visions of his departed Dad, but these scenes seemed gratuitous and silly. I think they exists simply to validate the movie’s name, and they didn’t work. Ultimately, The Ghost of Frankenstein offers a very average horror film. The story has some potential, and the execution isn’t terrible. However, compared to its three predecessors in the Frankenstein series, it clearly doesn’t live up to those heights. Those were arguably the three best horror flicks of their era, while Ghost offers just another movie. It’s watchable but nothing more than that. The Ghost of Frankenstein appears in an aspect ratio of approximately 1.37:1 on this Blu-ray Disc. Another day, another wonderful Universal classic monsters transfer! Sharpness worked well, with only a smidgen of softness at times. The image used some footage from the 1931 Frankenstein, and those shots tended toward the weakest of the film, but they popped up briefly and didn’t make a substantial negative impact. Most of the flick boasted strong accuracy and delineation. I witnessed no signs of jagged edges or moiré effects, and edge haloes remained absent. A natural layer of grain implied a lack of digital noise reduction, and print flaws failed to mar the proceedings. Blacks seemed deep and dark, with contrast that fared well and left the movie with a pleasing silvery appearance. Shadows appeared smooth and clear. I felt very happy with this strong transfer. While not as good, the movie’s DTS-HD MA monaural audio worked fine for its vintage. Speech occasionally felt a bit reedy, but the lines remained intelligible and without obvious edginess. Both music and effects showed the expected lack of real dynamic range, but they came across with reasonable clarity and brightness. The mix lacked pops, clicks or other background noise. This was a satisfying soundtrack. How did the Blu-ray compare to the original DVD from 2001? Audio was clearer and smoother, while visuals appeared tighter, cleaner and richer. While the DVD worked fine for its format and release period, the Blu-ray offered obvious improvements. Like most of its Universal monsters siblings, Ghost comes only with the film’s trailer. After the excellent Son of Frankenstein, The Ghost of Frankenstein offers a disappointment. While not a bad film in its own right, it seems relentlessly average. The Blu-ray brings very good picture and audio but it lacks significant supplements. While the movie leaves me unenthused, the Blu-ray represents it well. As of fall 2018, Ghost of Frankenstein can’t be purchased on its own. 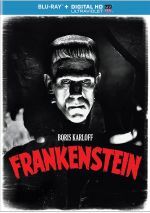 It can be found as part of an eight-film “Frankenstein Complete Legacy Collection”. In addition to Ghost, we find Frankenstein, Bride of Frankenstein, Son of Frankenstein, House of Frankenstein, Frankenstein Meets the Wolf Man, House of Dracula, and Abbott and Costello Meet Frankenstein. 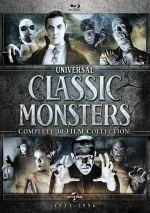 In addition, Ghost comes in the “Universal Monsters Complete 30-Film Collection”. 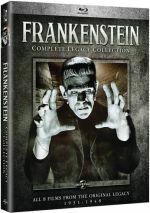 It actually packages the Frankenstein set mentioned above with similar compilations for six other Universal Monsters.